It was one of my friend’s Wedding Anniversary last week. I wished him on his big day. Ten minutes later his reply arrived. Ouch. Now I was concerned. He is not perfect, but he still deserves a better fate than being shredded into a thousand tiny-tiny pieces – which, I am sure, is what awaits any husband if they forget the wife’s birthday or the wedding anniversary. Ah Man! What a lucky escape! But thinking over, that is what you call : A Match Made in Heaven. Like this Pachadi and unbelievably soft Sweet Potato chapatis (will post the recipe tomm. ), a match made in heaven, just for kids. I am a big fan of sweet pachadi. I came across this recipe in Jeyashri’s Kitchen. The bright and shiny picture immediately caught my attention. This is typically served for weddings and feasts in very small quantities. 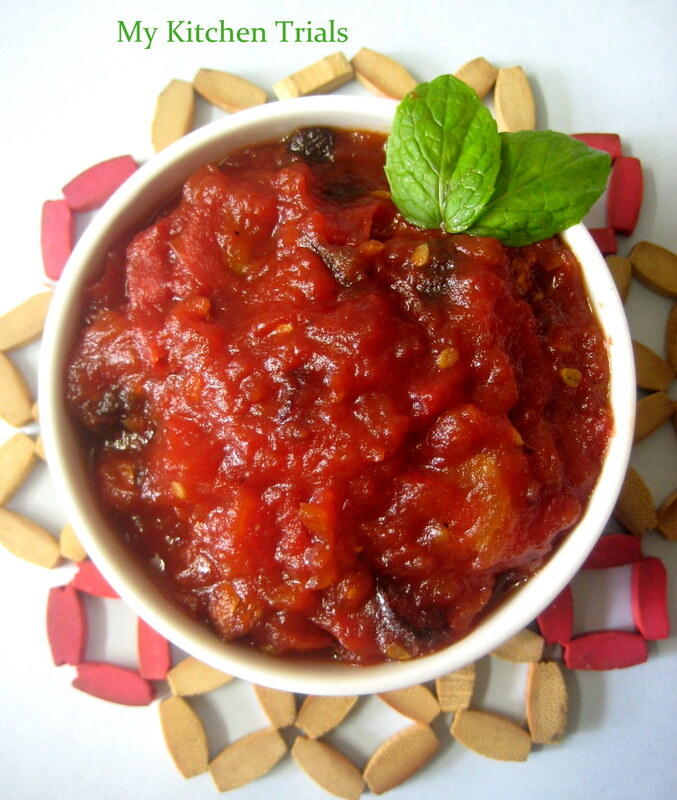 Add the sugar, water and chopped tomato pieces in a thick bottomed vessel and keep mixing in a medium low fire. Keep stirring continuously till it reaches the semi solid jam/pachadi state (10 – 15 min for me). Heat ghee in a separate pan, add chopped dates, raisins and chopped cashews. Add to the pachadi, mix. Serve with rice or chapati. Note : I over cooked it a bit, if you look at the original recipe, it is much more glossy and shiny. Also, I would blanch the tomatoes next time. nice addition of dates n raisins!….must taste yum with fresh bread! That’s very innovative one rajani..:)..love that bright red colour.. Ooh..I love the bright red colour of pachadi..making me want to reach and grab the bowl. lovely dish .. neat presentation with contrast colors …..
Wow what abright picture and recipe sounds yummmm. awsum…love the color …raisins in the chutney..waiting for tom’s recipe. This is so easy and first time i am seeing. Bookmarked. love the addition of dates! 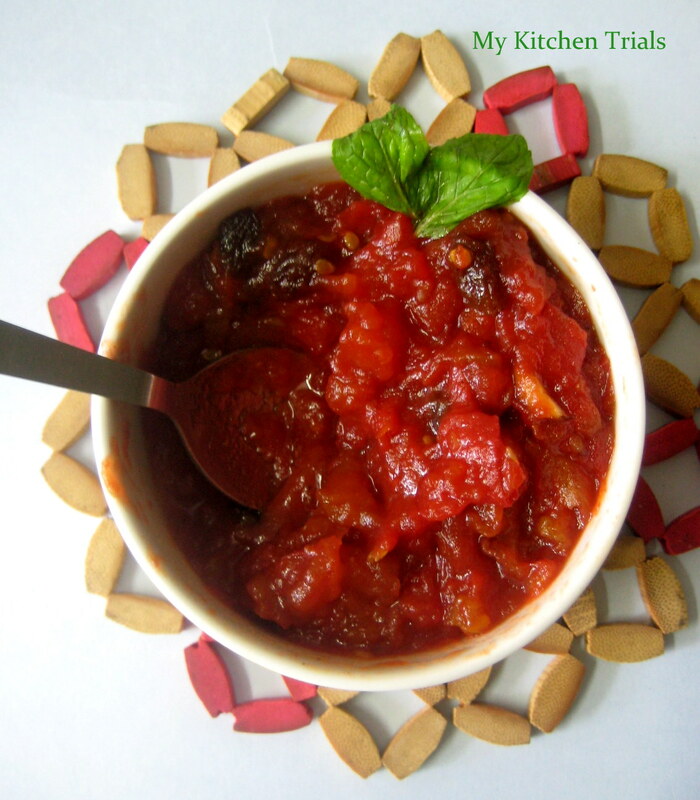 Delicious chutney,love the addition of dates to it…. 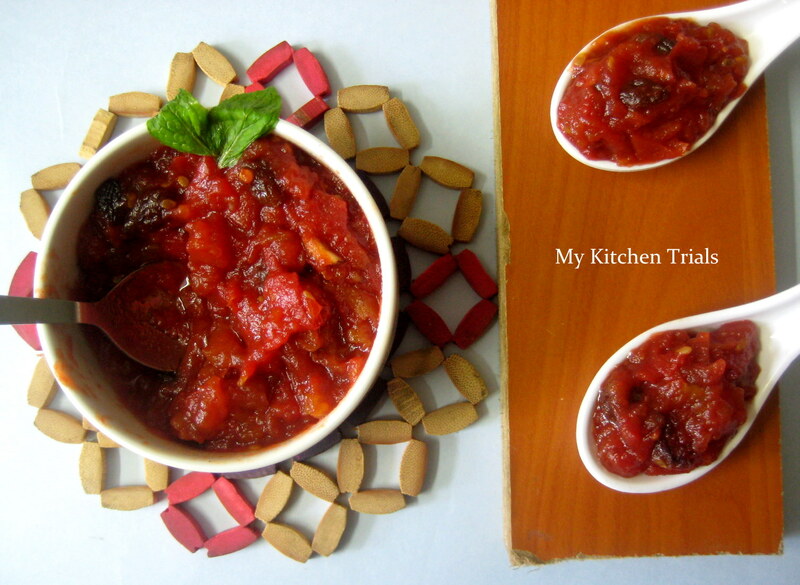 Yummy sweet pachadi with tomatoes. Looks delicious. Never tried a sweet version chutney. Sounds yum. Love the addition of dried fruits. Looks like a nice accompaniment to rotis. Lovely pachadi/salsa! Would love to have this with corn chips. But wondering how the addition of raisins would taste like..